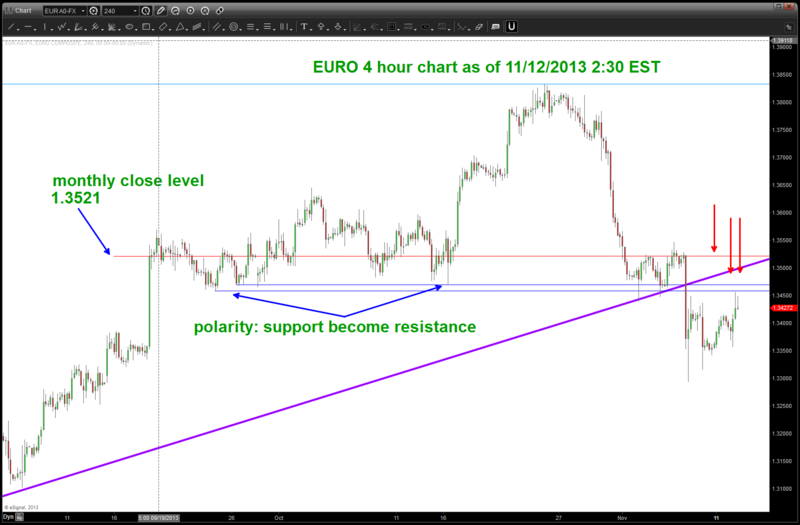 EURO correction complete, shall we resume lower? 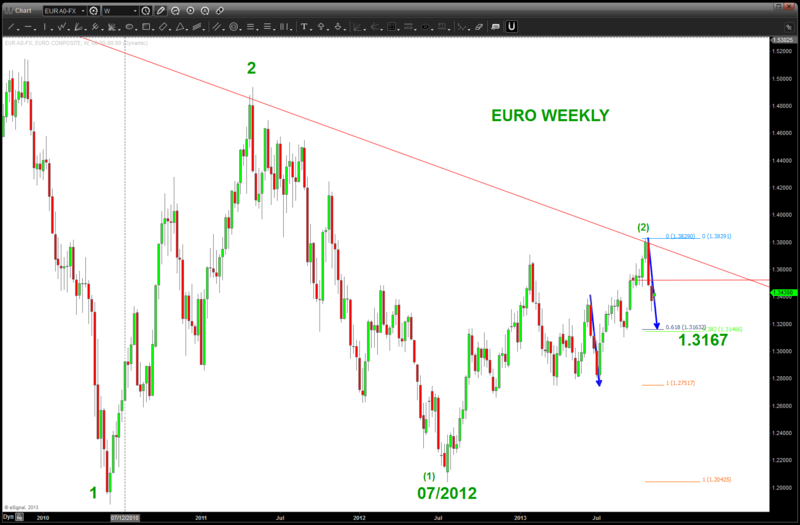 MACRO SUMMARY: the correction on the EURO from 07/2012 is showing signs of being complete. Additionally, if you have been following our dollar index posts, you’ll see that the next advance of the US Dollar “should” be getting underway. Since the EURO is a major component of the US Dollar index we need to look at it to work a “first opportunity” to get short on a nice pullback. TRADING SUMMARY: we are at or nearing completion of a final corrective leg that will target 1.3167 for a potential first support zone for this next leg down. 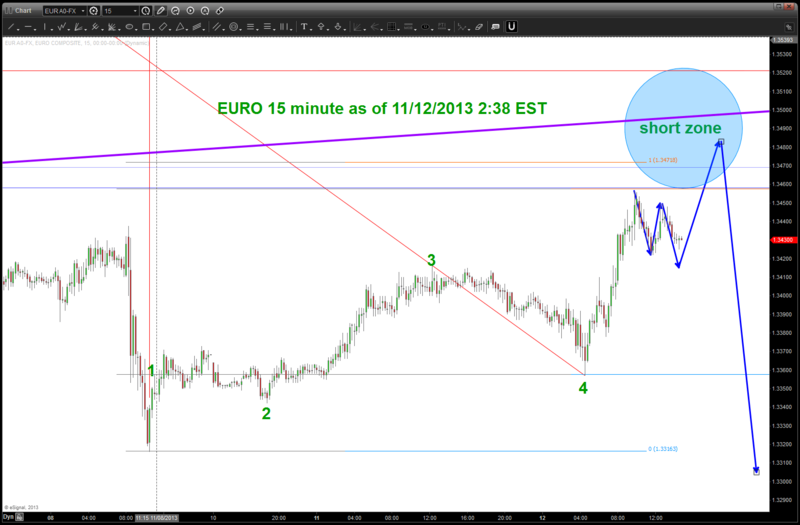 near term, favor support to be found on an intra-day basis around 1.3410’ish and one final move up into the 1.3460-1.3520 area to SELL and signal a start of the next wave down. consider this analysis incorrect if we get an hourly close, with thrust, above 1.3550.
note, once the high was in during 2007 that on the pullback’s the RSI resistance band had “shifted” to the bear market range. the count, even on this monthly has been tough. 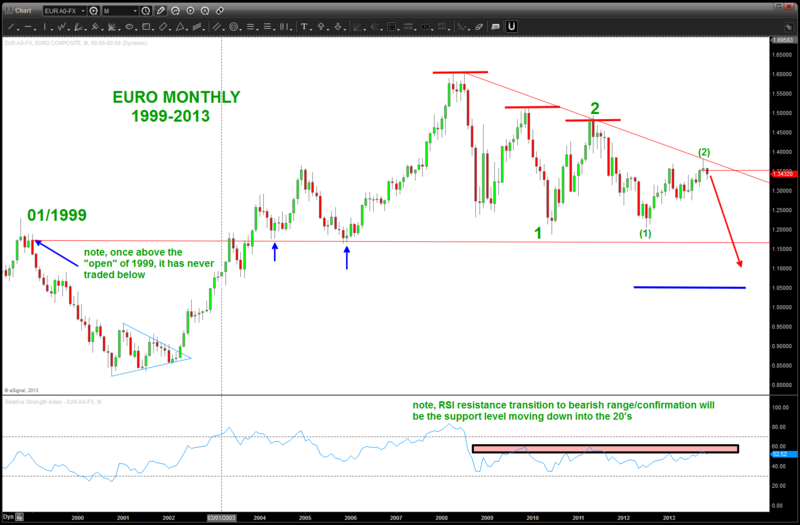 right now I am favoring that wave (2) of 3 just completed and we are in the very beginning stages of the swift, powerful (3) of 3.
just as important is our red line showing the monthly close level of 1.3521 that held and had the market bouncing around for a while, that should also offer continued resistance. final leg of a 1,2,3,4,5 C wave in progress .. favor one more push into the BLUE ELLIPSE for a SHORT zone to resume bearish posture. Unfortunately, right now, that entire zone has all kinds of targets …looking for 1.3410 to signal a minor correction complete for one more advance.